2-pdr. in Mark VI Octuple Mount on HMS Ark Royal in 1939. The large boxes on the right are for ammunition. This is a low velocity mounting. Also known as the "multiple pom-pom," this weapon was essentially a redesign of the 2-pdr Mark II to suit an eight gun mounting. The Mark VIII used the same barrel as the previous weapon, but the new design did have an improved automatic mechanism and replaced fabric belts with steel-links belts which reduced jamming. It has been speculated that the reason that the 2-pdr shell was selected for this weapon was because there were about 2,000,000 rounds left over from the First World War. This weapon had a long development history. It started off when six 2-pdr Mark II guns were mounted on a common base on HMS Dragon during 1921-22. This was modestly successful, and as a result design work was begun by Vickers and Armstrong on various multiple-gun designs. Armstrong produced a design that allowed continuous fire while the Vickers design did not, but the Armstrong product was also a more complicated design. Vickers won the contract and presented an eight-gun mockup for examination in July 1923 at Vickers, Dartford. Lack of funding delayed proving ground firing trials out to 1927, with sea trials aboard HMS Tiger not being held until 1928. Service introduction was delayed to the end of 1930 and consisted of a single mounting installed on HMS Valiant. Satisfactory completion of trials on Valiant encouraged the Treasury to increase funding and during 1931 Nelson, Rodney and Revenge each received one mounting while Hood received two. The following year saw Furious and Royal Sovereign each receiving two mountings while Renown received one. Production was slow up until just before the war started. At the time of its service introduction in 1930 this was a very advanced weapon, but by 1939 the rapid improvements in aircraft design had rendered it obsolescent, as it had a low muzzle velocity, lacked a satisfactory explosive shell and no tracer ammunition was provided. To remedy some of these issues, a higher velocity projectile (HV) was introduced in 1938 but this required a different breech mechanism and other changes to the firing gear. However, guns firing only the older low-velocity projectiles were still manufactured throughout World War II. High velocity and low velocity ammunition and guns were not interchangeable. There were also several other gun variations, as shown in the data tables below. It should be noted that standardization was never a high priority in British ordnance thinking prior to the 1950s. 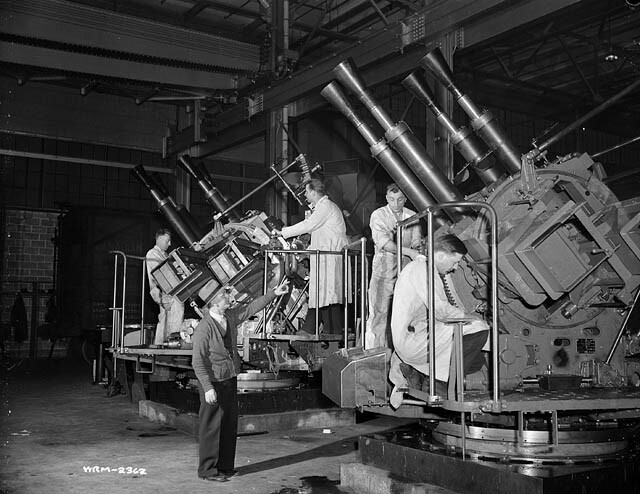 These guns were manufactured in large numbers throughout World War II, with total production being about twice the number of Bofors 40 mm guns used by the Royal Navy. The Naval Gun Register shows that 6,691 guns were made in Britain including 12 prototypes and a further 843 guns were manufactured in Canada. There were also 219 ex-land service (Army) guns made which were scrapped in 1944-45. Single and quad mountings for smaller ships were also produced after 1935, with the single mounting being widely used as a bow-chaser on coastal convoy escorts during the war. As originally introduced, this was a recoil operated, "controlled" (essentially semi-automatic) weapon which used a manually turned crank to operate the firing gear in the quadruple and octuple mountings (see note below for a further explanation). 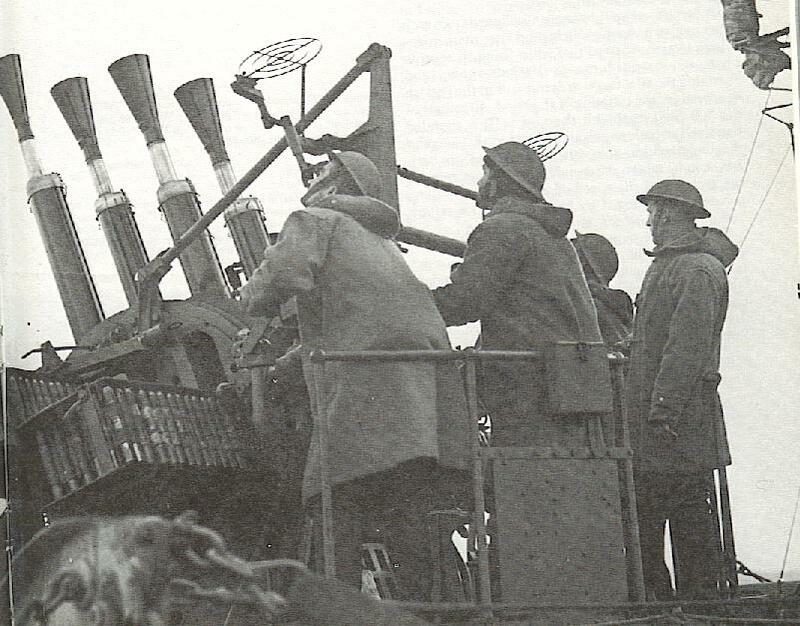 In 1939 the octuple mountings design was changed to allow fully automatic firing but this was not extended to the quadruple mountings which were only produced in controlled versions throughout the war. However, the quadruple mountings did replace the crank-turning crewmember with an electric motor sometime during the war. The internal gun mechanisms were very complex and required much care and skilled maintenance to keep them in working condition. Jams and stoppages were frequent, although the linked ammunition proved to be more reliable in service than the older belt-fed guns. Constructed of monobloc barrel and the breech block moved parallel with the gun axis. Actual bore length was 39.37 calibers. ^The different positions in the octuple mounting required different designs for the right and left hand outer and inner guns, suffixed as RHO, LHO, RHI and LHI. Quadruple mountings had right and left hand upper and lower guns and single guns were RHI. For all outer guns and for the upper guns in quadruple mountings, the connecting block in the gun - which took the barrel, buffer cylinders and ejector tube - was lengthened by 13 inches (33 cm) to allow the ammunition feed for inner and lower guns to pass through. ^These weights probably do not include the cooling water. Only CHVW and AHVW guns were fitted for water recirculation, other models had simple water jackets. The common filler for these was a prominent funnel at the rear of the gun assemblies, as can be seen in the sketch of the Mark VII quad mounting shown below. ^Controlled Firing - In any multiple automatic weapon mounting, if each gun is allowed to fire on its own then they are all going to cycle at a slightly different rate. This means that at some point they are all going to be firing simultaneously, causing obvious shock and vibration problems as well as creating a "gap" in the bullet stream. An alternative to letting the guns fire freely is to synchronize them in some manner such that they fire sequentially and in a pre-determined pattern. This was the path that the British chose for the multiple 2-pdr mountings, and the use of the cranked firing gear for these mountings ensured that the guns were synchronized - which the British for some reason called "controlled." In other words, the cranked firing gear meant that all guns fired at the same rate and in a planned sequential order and effectively meant that these were semi-automatic, not automatic weapons. In the case of the quad mounting, the guns fired in pairs and the octuple mounting fired in quads. 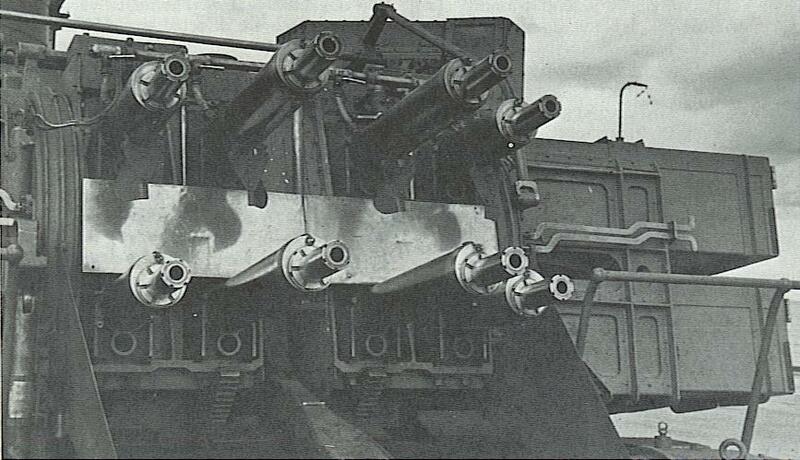 In 1939, the British apparently concluded that the concerns of allowing the guns to fire freely was less of a problem for the octuple mountings than it was for the quadruple mountings and so changed the octuple guns so as to eliminate the "controlled" firing gear. ^The Low Velocity type was first introduced in 1914. The High Velocity type was introduced in 1938. HE tracer does not appear to have been issued prior to 1942. 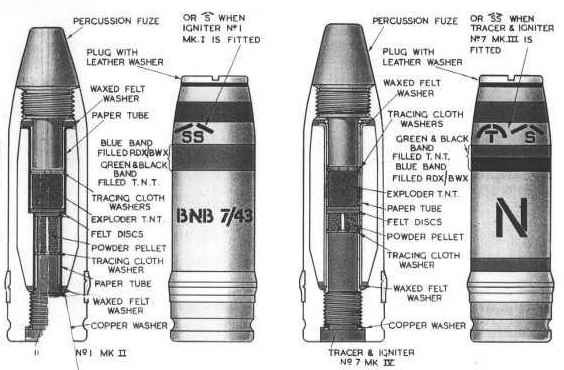 ^LV projectiles were originally issued with Dual Action Fuzes which had both time and impact functionality and these were still being used up during World War II. 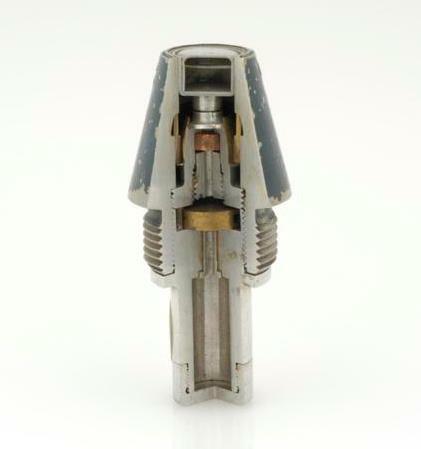 See 2-pdr Mark II - Dual Action Fuzes for details. ^The usual outfit was HE and HE tracer, but SAP and AP were issued to a limited number of ships. ^Ammunition was supplied in 14-round steel-linked belts which could be hooked together. Ammunition feed boxes held 140 rounds per gun for the octuple mounting, 112 rounds for the quadruple mountings and 56 rounds for the single mounting. Note that these are all multiples of 14. ^The Mark V differed from the Mark VI by having a heavier carriage and different controlled firing gear. Both were trained and elevated by a self-contained electro-hydraulic system powered by an 11 hp motor. 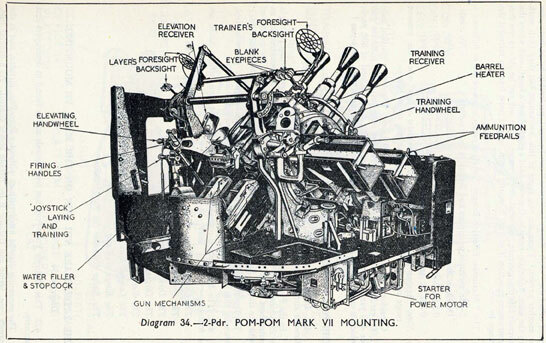 The later octuple mountings with motorized firing gear were introduced in 1939 and designated as Mark VA and Mark VIA. 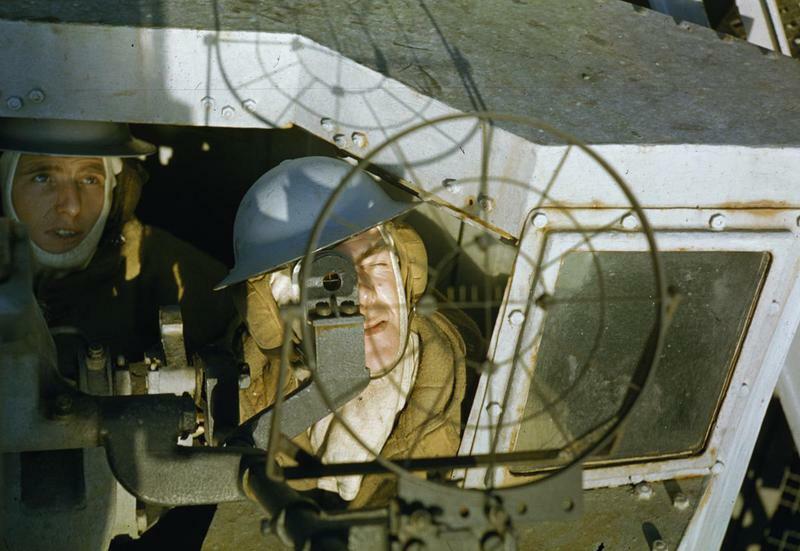 As originally introduced, guns lacked shields and flash hiders. Most mountings had these added during the war. ^Mountings capable of firing the HV projectiles are indicated by the star (*) in their designations. ^At the start of the war, octuple mountings had been installed on battleships, battlecruisers, some 8-inch (20.3 cm) cruisers, the AA cruisers Coventry and Curlew, and the minelayer Adventure. The largest number at this time was four Mark VI mountings on both Warspite and Ark Royal. By the end of the war, there were as many as eight octuple mountings on the King George V class battleships while the battleship Nelson, the cruiser Sussex and the fleet carriers carried up to six octuple mountings. ^RPC and water cooling jackets were added to the Mark VIA* mountings at the same time. 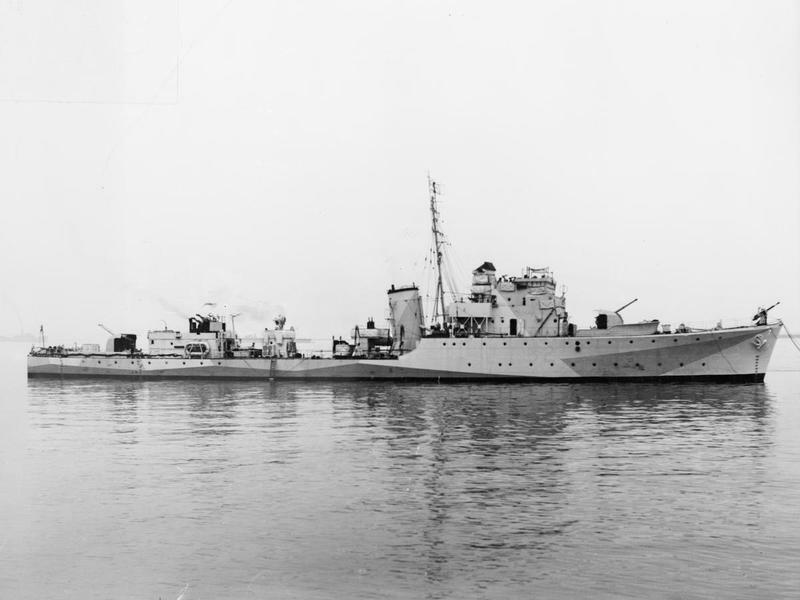 ^Quad mountings were introduced for smaller ships in 1935-36 and was first successfully tried on the destroyer HMS Crusader (H60). By September 1945 there were six RP 50 mountings on each of the Colossus class carriers, the cruisers Glasgow and Liverpool and six Mark VII*P mountings on the battleships Duke of York, Anson and Howe. Destroyers starting with the "Tribal" class and up to some of the "S" war emergency class destroyers had a single quad mount installed amidships. Some earlier destroyers had a single quad mount fitted during the war. ^USN Mark 14 gyro sights were added to some quad mountings in 1945 as an anti-kamikaze measure, mainly for ships intended for the Pacific area of operations. At least the battleships HMS Anson and HMS Duke of York and the carrier HMS Implacable were so fitted. ^7.17.27.3The Mark VII and Mark VII* were hand elevated and trained. The Mark VII*P was a late war quadruple mounting with self-contained power that had a dual joystick control. RP 50 Mark VII* mountings also had local joystick controls. Power control was still controlled by the hand cranks, which allowed a simpler "hand clutch" return to manual operation in the event of a loss of power. The crew for the quadruple mountings consisted of eight men, starting with the gun captain, who was in general charge and operated the firing clutch lever. The remainder of the crew were the gunlayer, trainer, ammunition feed numbers and loaders for right and left guns. ^Production of guns in single mountings apparently did not start until the late 1930s. ^The single Mark XVI and XVI* mountings were derived from the twin 20 mm Oerlikon Mark V mountings. The Mark XVI was hydraulically powered by an off-mounting driven by the main or auxiliary engines on coastal craft. In the Mark XVI*, an electric motor was provided to drive the pump. Both versions had scooter control. Some of the Mark XVI* mountings were fitted with USN Mark 14 gyro sights and used on the carrier Ocean and some cruisers and destroyers assigned to the Pacific fleet in 1945. 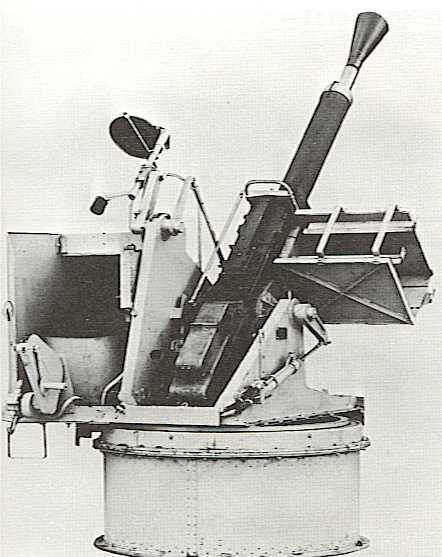 Elevation was restricted compared to other 2-pdr mountings as the position of the elevating trunnion axis was lower, due to the smaller nature of the Oerlikon guns. 57 twin mountings were made for the Army, but none were ever used afloat. 2-pdr. Mark VII Quad Destroyer Mounting. The second crewman from the left is the crank turner. Note the simple ring sights. 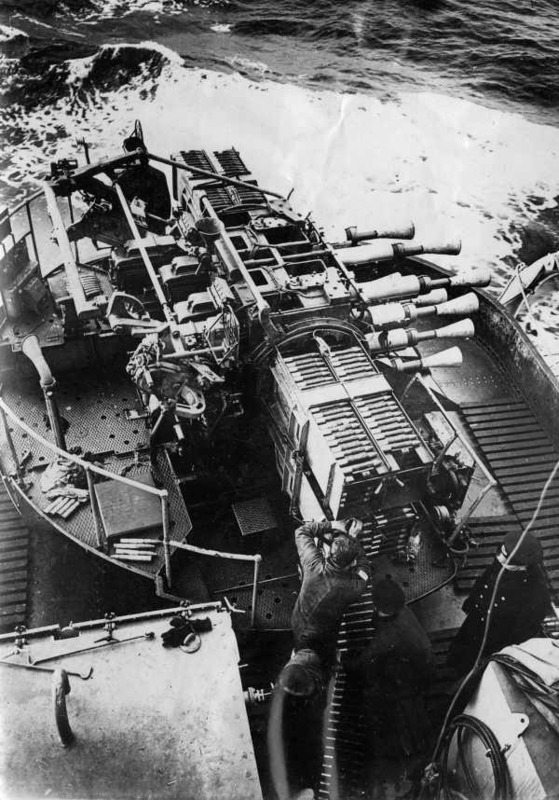 Reloading an octuple 2-pdr on HMAS Shropshire. State Library of Victoria Image H98.105/3247. 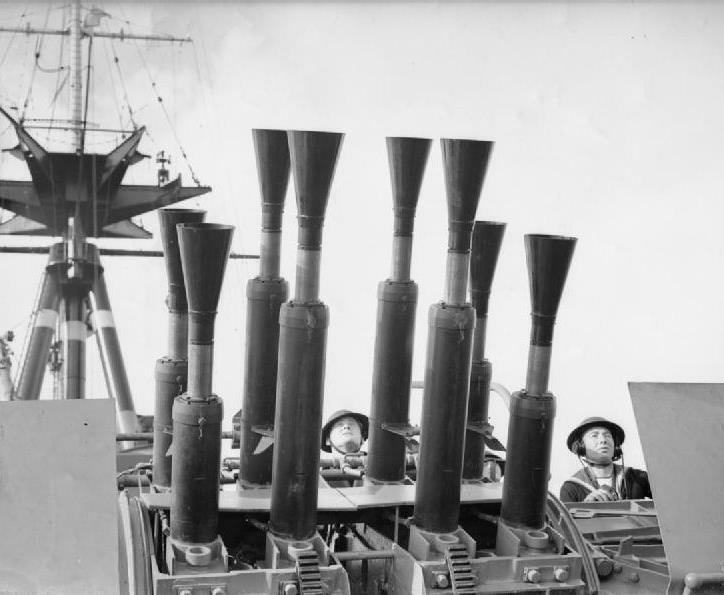 Octuple 2-pdr on HMS Rodney. The barrel offsets to allow the belted ammunition to reach the inner guns are apparent in this photograph. IWM photograph A 829. Quad 2-pdr. in "X" position and single "bow chaser" 2-pdr. on HMS Weynell, a Hunt I Destroyer. Bow chasers were popular on coastal escorts as a defense against German E-boats (Schnellbootes or S-bootes). The Hunt I destroyers were originally to have three twin 4"/45 (10.2 cm) Mark XIX mountings, but an error in stability calculations resulted in the removal of "X" mounting and the substitution of the quad 2-pdr. in its place. IWM photograph A 7049. Gunsight on 2-pdr octuple mount. IWM Photograph TR 330. Quad 2-pdr mounts under construction at the Dominion Engineering Works plant in Canada. National Film Board of Canada photograph as Library and Archives Canada Photograph 3196183. 2-pdr. Mark VII Quad Mounting. Sketch from B.R. 224/45. Single Mark VIII gun in Mark XV mounting. This mounting was adapted from the 20 mm Oerlikon Mark V mounting. The Mark XVI mounting was very similar. 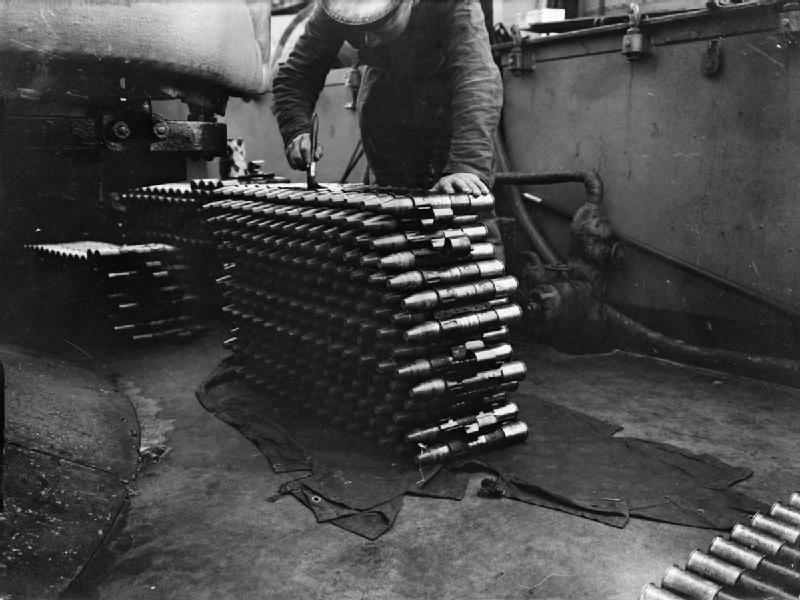 Greasing 2-pdr ammunition aboard HMS Kelvin. IWM Photograph A 2263. 2-pdr HV Rounds. Sketch courtesy of Steve Johnson's Cyberheritage Website. Caption from IWM: "British No 243 Mark IIN fuze (Sectioned), Second World War period (manufactured 1940?). The No 243 percussion (direct action) fuze was introduced in 1938. It was of the hammer and shear wire type in aluminium alloy for use in Naval 2-pounder anti-aircraft guns. The No 243 ran to three 'Marks' and was declared obsolete in 1943 but re-instated in 1946. It was finally declared obsolete in 1957." IWM photograph MUN 2753.